Elaborated with clear material, the ecological non-marking tyre was specially developed in order to eliminate marks and residues caused by tyre wear. Its main functions are to avoid black driving marks on the floors and to maintain a high puncture and wear resistance. 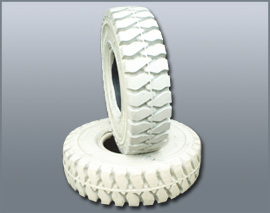 It delivers high load capacity, while excellent stability and low rolling resistance. It is particularly recommended for food, pharmaceutical industries or any other in which a cleaner working environment is required. It does not leave driving marks. Extra long tread life. It delivers Maximum stability. It does not leave driving marks.